31-W Insulation has been providing dependable home improvement services to homeowners in the Charlotte, North Carolina, area since 1972. We specialize in many different services, including home insulation replacement. 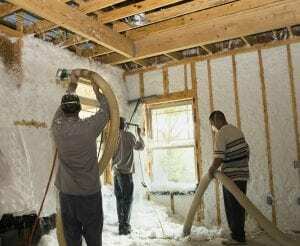 If there are areas of your home that are drafty, or if you notice significant temperature differences from room to room, there is a good chance that you need new home insulation installed. Our experienced technicians will be happy to conduct a professional inspection to determine you insulation needs. No matter what type of insulation you need, or what your budget is, 31-W can provide you with a long-lasting solution that will help your home maintain a more comfortable and consistent temperature. We only use high-quality products from trusted manufacturers like Owens Corning®, CertainTeed, and Tytan Foam Sealants, so you can be sure that your new home insulation will provide you with years of reliable service. Moreover, we rely solely on our highly trained company employees to perform all inspections and installation – never subcontractors – which allows us to maintain our strict workmanship standards. If you would like to learn more about the different types of home insulation we install throughout the Charlotte area, contact 31-W Insulation today. We are happy to answer any questions you may have.